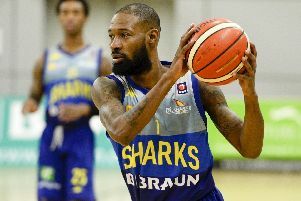 Royalty signs for Sheffield Sharks! Basketball royalty comes to Sheffield! DBL Sharks Sheffield have signed their first 'non-national' signing of the season - a man called Edgar McKnight III! American point guard McKnight, a six footer from 6’0 New Orleans was a star University player and all-time leader in assists, averaging 14 points and 6 assists a game. help his team reach the Playoffs averaging 4pts and 3 assists. With relative experience in high standard leagues Mackey will be the starting point guard and is looking forward to the challenge. looking forward to working with the squad we have this year” said McKnight. The DBL Sharks are set to announce further signings imminently and are looking forward to their first championship fixture against Surrey. have always given us a close game” said Lyons.